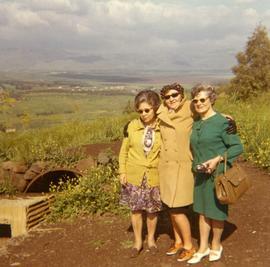 Photograph depicts Ann and two other women in Golan. Photograph depicts Ann posing in front of a Jeep. Kodachrome 35mm slide depicts a Syrian tank destroyed during the Six Day War, in Golan Heights. Golan Heights was Syrian territory, which became occupied by Israel in 1967. It is currently under Israeli control. Kodachrome 35mm slide depicts a group of unidentified men and women standing, crouching, or sitting near a building, in Golan Heights. 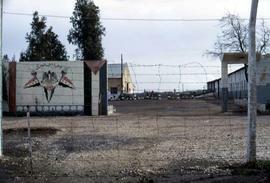 Golan Heights was Syrian territory, which became occupied by Israel in 1967. It is currently under Israeli control. Kodachrome 35mm slide depictsa landscape scene with brush, rocks, and a small waterfall, in Golan Heights. Golan Heights was Syrian territory, which became occupied by Israel in 1967. It is currently under Israeli control.